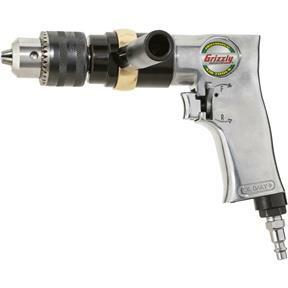 Features include a pistol grip with trigger switch, forward and reverse switch and 1/4" NPT female air inlet. The 1/2" chuck accepts drill bits down to 1/64" and includes a chuck key. The auxiliary handle can be positioned anywhere around the drill body. 650 RPM @ no load. Weighs 4 lbs. Excellent tool and a real bargain compared to other brands. I've never been unhappy with all my Grizzly purchases.